Here is our sweet boy by Campaign. Primary Colors is affectionately known as Colors. He is not a very big fellow, which makes him perfect for guest handlers on the obstacle course who are interested in trying out "walking with a llama" for the first time. He has also received his sire's quiet disposition and a very correct frame. His reverse appaloosa coloring make him a favorite of nearly everyone that steps on the farm. Colors won his first ribbon in an obstacle course at a training show. 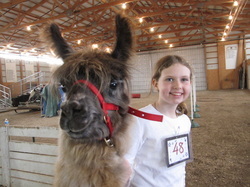 He won several ribbons at the Tippecanoe County Fair with Fiona, and then with Vickie, went to the 2011 Indiana State Fair where he was titled Grand Champion Mini Male in the ILR-SD show and Reserve Grand Champion Mini Male in the ALSA show. He also placed 10th in the novice obstacle course out of more than 50 competitors! This is one, very neat llama! And more news about Primary Colors ... he won Grand Champion Miniature Male at the HLAA Fall Show in Noblesville, Indiana, 2011! For more photos of him, you can visit his page in Flickr. 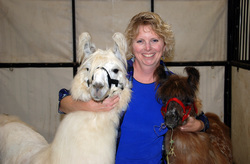 Vickie with Blanco and Primary Colors at the 2011 Indiana State Fair, Indianapolis, IN. 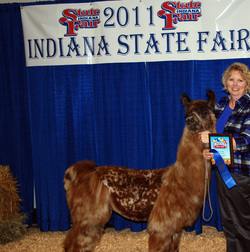 Hard Rock's Primary Colors was Grand Champion Mini Male in the ILR-SD Show at the 2011 Indiana State Fair. He was Reserve Grand in the ALSA show. He also placed 10th in the ILR-SD Novice Obstacle Class out of more than 50 competitors!